A lot can happen in a decade. 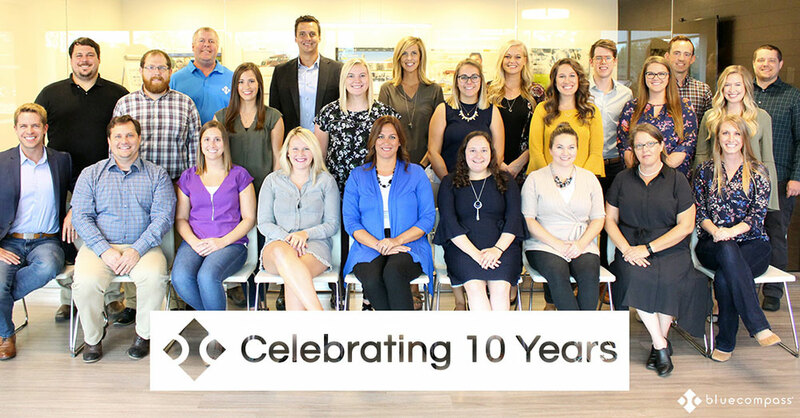 As Blue Compass celebrates its 10th anniversary, I decided to look back at a few things we’ve learned from our years of running a digital marketing company. Ten years ago, two young guys with a couple computers in a basement, launched Blue Compass. Today, we’ve been blessed to be one of the Midwest’s leading digital marketing companies working with everyone from Fortune 500 companies to small family businesses around the U.S. and the world. I’m thankful to have experienced an incredible time of learning and growth in the last decade. There have been huge successes I never dreamed we could accomplish, but I’ve also made my fair share of mistakes along the way. While I’ve learned from the successes, the failures have taught me much more. Here are the top 10 things I’ve learned at Blue Compass. These insights have helped us find great success, and I hope they help you on your journey. A few years ago we sat down with the marketing team of a national financial company to discuss their digital marketing strategy. With thousands of employees and decades of experience, their brand had some impressive offerings. However, we noticed their website focused almost entirely on the company itself and not its audience. “Your website has a lot going for it,” I said, “but I see it provides visitors only with information about your brand. What if we start using the blog to post articles that don’t talk about your company, but provide compelling content focused on your audience?” we went on to encourage them to focus less on talking about the expertise they have and more on sharing that knowledge with their audience. We could see the members of the marketing team were immediately uncomfortable. It was as if we had suggested they start linking to a competitor’s website. They were concerned that if they gave away this financial expertise, their audience might not need them any longer. And what if their competitors began using these financial insights? Sharing your expertise with potential clients can be intimidating. In fact, it’s counter to the way many of us have worked for the last 50 years. Most businesses only advertise how great their products or services are. We have found that most people aren’t especially interested in ads that tell them who or what they need. They want to do business with brands that care enough to provide them with valuable expertise. Blue Compass has seen incredible results from giving away our expertise. We do this through speaking events, free website audits and blog articles. 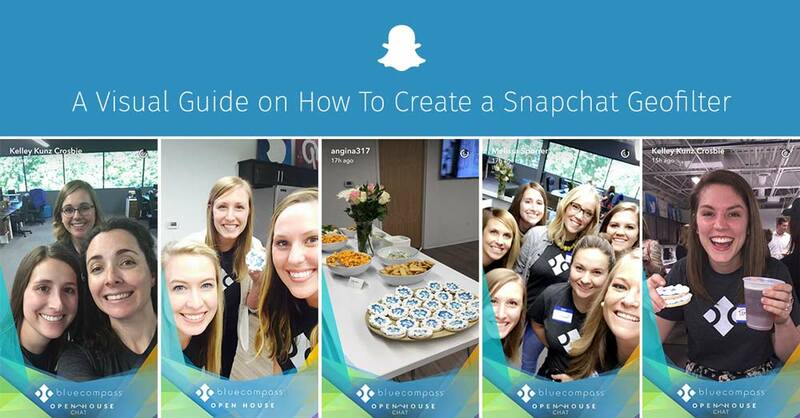 For instance, we recently wrote an article that shows readers 100 percent of our Snapchat Geofilter design process and strategy. Anyone can read this article and know exactly how to create their own Geofilter. No need to work with Blue Compass. We originally posted this blog article on a Wednesday. That same day, we received a call from someone asking if we would create a Geofilter for an upcoming event. The next day we received an email inquiry requesting a quote for another event. The day after that we were contacted by a large amusement park asking us to design a Geofilter for their new roller coaster, and we’ve had numerous inquiries since then. The best way to prove you’re an expert is to show it, not to claim it. People appreciated our no-strings-attached guide and wanted to work with us because of it. We have found the more you give, the more you get, both in business and in life. In fact, I've been so personally impacted by the effectiveness of this approach that I wrote a book this year about its benefits. Years ago I spent most of my free time on entertainment like movies and video games. As time passed, I realized that I have to be continually learning or I won’t be able to serve my team and clients the way they deserve. Now, I’m always reading a book on digital marketing, leadership or personal improvement. I’ve almost eliminated music from my spare time, listening instead to podcasts on personal development or motivation. Every business is currently traveling in one of two directions: forward or backward. We have found that a deep emphasis on learning helps us continually move forward. Many of us are so anxious to express ourselves in the workplace we barely pay attention to what our coworkers are saying or feeling. Talking feels good because we all want others to care about our thoughts and perspective. But, that’s precisely why listening is so powerful. Truly effective people care enough to listen and understand their team. Listening is an exceptionally essential skill for leaders. I’ve seen many meetings in which the leader begins by telling everyone what he or she thinks, then asks what everyone else thinks. That’s a great way to close down communication and encourage team members to rethink their positions. Great leaders first ask others’ opinions, genuinely listen, then offer their thoughts. “What’s your goal for Blue Compass?” a friend recently asked me. “Do you want to grow or are you satisfied with where the company is currently?” For us, the answer is quite simple: if your company is not actively working to grow it’s in decline. We’ve found that businesses wanting to embrace the comfortable status quo generally don’t respond well to change, and we live in a fast-paced world that’s constantly changing. Modern companies that embrace change, take risks and focus on continual growth have an advantage over more traditional organizations that want to play it safe. This is especially true for tech companies. In this case, “growth” isn't simply referring to profits or number of team members, although growth in these areas is certainly positive. Successful organizations are always focused on growing their customer service, efficiencies, influence, brand awareness, relevance and knowledge. In our early years, we had a young person leave our team. In the exit interview, the team member mentioned two negatives about the time with us, saying “you need to provide better communication and a clearer path to promotion.” It was an enlightening moment for us, and indeed we’ve found these two desires to be very common among Millennials. Of course, we’ve all heard the complaints about Millennials. This generation, born roughly between 1980 and 2000, is regularly referred to as entitled, difficult-to-manage and impatient. In some cases these claims are true. However, we believe many managers simply don’t understand these younger employees and thus fail to access the Millennial advantage. Our company is currently comprised of about 85 percent Millennials (including myself). This is a generation unlike any other, and we’ve learned much about what makes them tick since the creation of Blue Compass. In our earlier years, we struggled with hiring and managing younger team members. Today, our young team thrives because we know how to capitalize on strengths. This is a generation that grew up with laptops, smartphones and social media. They are tech-savvy, embrace learning and desire honest feedback. Our young team has really encouraged us to be open, honest and transparent. We work hard to provide an incredible culture with a purpose for our team. In fact, we even built out a new office last year with Millennials specifically in mind. No small office cubes that close off communication, a cafe for team lunches, walking treadmill desks and a coffee lounge have helped our team feel comfortable and communicative. In return, we’ve experienced huge benefits to working with this important generation. I suppose this one seems a little self-serving coming from a digital marketing company, but we’ve simply seen so many successes come to organizations that take search engine optimization (SEO) seriously. We believe SEO is 100 percent essential for any business that has a website it wants people to visit. SEO is so important that we have pushed our team to consider it in every marketing effort we undertake. We read, talk and learn about it every day. SEO is a guiding value for us. It’s in our DNA. Why emphasize SEO so much? Because good SEO equals more qualified people spending time on the web pages you want them to experience. More qualified people on your pages means more conversions. More conversions mean more sales. More sales mean more profits. It’s that simple. Search is the dominant way to discover content on the Internet. We’ve watched website traffic and reviewed the analytics of hundreds of sites over the years, and I can tell you that in nearly all cases, the highest quality traffic comes from organic search. Not from social media, not from directly typing a URL into a browser, not from referring sites, not from online ads and not from paid search ads. In fact, a recent study shows that all non-organic search channels combined – paid search, social, display, email and referred – don’t compare to the impact that organic search commands across all industries. In other words, SEO has a better chance of getting you new clients and sales than any other online tactic. It’s been something that has helped Blue Compass stand apart from competitors and I believe it has great value for your brand. We play an interesting game at Blue Compass. Our main conference room has one wall comprised entirely of glass. When we hold interviews, the interviewee typically sits with his or her back to the glass. Years ago, a couple of our team members started trying to make me laugh while I interviewed people. It started with such attempts as a cartwheel or a funny face. Soon it escalated to pushing each other around on chairs and breaking open a piñata. During a recent interview, I looked up to see a few of our team members carrying a full couch by the conference room while someone calmly sat on the couch, working on her computer (for the record, our team has not yet gotten me to laugh). Are these crazy interview hijinx 100 percent professional? Probably not. Could they shock an interviewee and turn that person off of Blue Compass? Absolutely. But I’ve never stopped these office pranks because they exemplify who we are. If a business wants long-term profitability and desires to provide employees with good quality of life, a positive company culture is absolutely essential. Blue Compass is known for its amazing culture. It’s taken years of learning and experience, but we’re very proud of the fantastic environment we’ve created for team members. We have found great success in encouraging joy and humor in everything we do. We fully encourage joking, pranks and good-natured teasing. 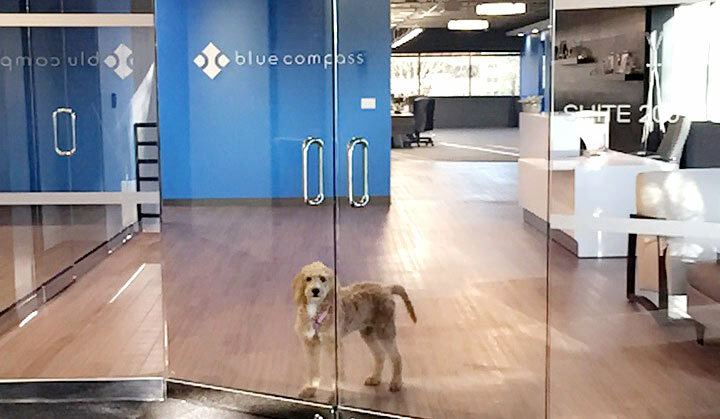 Nerf gun fights and office pets are not uncommon at Blue Compass. We believe laughter is the most important metric of a healthy company culture, and thankfully we have a generous dose of it on a daily basis. We’ve had people join our team from traditional ad agencies and been very surprised at the stark difference our culture has to offer. We are a team that supports each other - no internal politics, no fighting for power and no individual stars that are considered better than everyone else. No one is here to glorify themselves, but to uplift the team. For example, if anyone is working past 5:00 PM, I’ll almost always hear another team member ask, “How’s it going? Can I do anything to help you?” before they leave for the day. Simply put, we have each others’ back. Don’t let company rules and regulations squeeze the fun out of your office environment. Having an occasional team lunch doesn’t cut it. Foster an environment where everyone laughs and feels supported every day. And let pets visit (at least occasionally). The biggest mistake I made in our early years was hiring too soon and without enough information. Hiring the right people is an incredibly difficult process and who you include in your organization has huge, resounding implications. Thankfully, we’ve learned much over the years and have an amazing team today. One of the most important characteristics we look for in potential team members is personality. Many companies look for the most impressive resumes that list eye-catching skills and accomplishments. Talent is essential, of course, but the right work ethic and values are also critical. You can teach skills, you can’t teach personality. It doesn’t matter how impressive someone’s resume is, we only hire people who are genuinely positive, totally team-oriented, intelligent and eager to grow. We will not hire or continue to employ anyone who engages gossip and drama - neither are allowed at Blue Compass. I always tell people that being at Blue Compass each day is like hanging out with a bunch of friends. I love this great group of people. I learn from them and am supported and encouraged by them every day. Ensure the people you add to your organization are positive, team-oriented individuals that will bring joy to your team. Have you ever worried about something so much it kept you awake at night and lurked into your thoughts nearly every chance it got? Early in our company’s history I frequently worried; “Will we have enough for payroll this month? What if this client leaves? Is everything beginning to fall apart?”. There is never a shortage of things to be concerned about. Proverbs 23:7 says, “For as he thinks in his heart, so is he.” One of the most valuable things I’ve learned is that we become what we think about. Humans are deeply influenced by what goes on in our heads. Our goal isn’t to escape problems because we can’t. Our goal is to focus on the positive instead of the negative. There are so many wonderful blessings that we’ve been given: amazing clients, an expert team, potential business growth, etc. How often do we take for granted the freedoms we enjoy, our family, or even the ability to walk or to see? At Blue Compass, we desire to focus our thoughts on the good, not the bad. If worries about cash flow or company growth crawl into my head I try rejecting them immediately. I refuse to be negatively influenced by such thoughts. I’m not perfect at avoiding anxiousness, but my quality of life has increased greatly since I’ve committed myself to rejecting worry. You may not always be able to control how you feel, but you do you have control over what you think. Change your thinking and you will change how you feel. Years ago, I had an interesting experience that made a huge impact on me. A few of my team members and I flew across the country to absorb information from thought leaders at a marketing conference. It was a great time with many memorable moments, but the most impactful experience came when we recognized a local company showing off one of their products at a booth. Three employees interacted with passersby while their boss sat nearby, staring into a phone. Interested, I kept an eye on them each time we passed by the conference floor, only to notice the same scenario. The boss continued to sit by while the team spoke with attendees. At the end of the conference, we said our goodbyes, grabbed our swag bags and boarded the plane back to Iowa. As we walked through the plane, we noticed the boss of this company on the same plane, seated in first class. As my team and I made our way past first class, we saw the boss’ employees huddled together in the back of the plane. I’m referring to this person as a “boss,” for a reason. We believe bosses sit ahead of their team while leaders sit with their team. Bosses sit ahead of their team while leaders sit with their team. Many business owners, CEOs and managers are followed by employees because their title requires it, but that doesn’t make them leaders. Real leaders serve their team. They work alongside, not above their employees. They care about people more than profits. They take a little less of the credit and a little more of the blame. If you’re in a role of authority, encourage and serve your team. Ask your team members how they are doing. Ask what is working and what is not. Ask what you can do to help. We love following leaders that care about us and inspire us. No matter your job title, be a servant leader that puts your team before yourself.